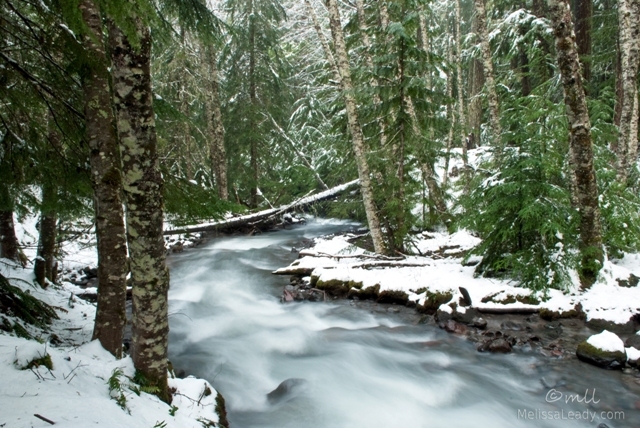 I photographed Zigzag River when we were camping up here last summer, and was thinking it might be a pretty photo in the fresh Christmas snow. So we drove up to Mt. Hood early yesterday morning for a winter photo hike. We never made it to the trailhead though because the access road hadn't been plowed and we didn't have our tire chains. This spot along the river is part of another trail we hadn't tried yet, and just as pretty. It's hard to go wrong in this area near Mt. Hood. So many nice trails to choose from, all created by the CCC back in the 1930s. I'm coming back up here soon for some more photography. Tire chains are in the car now just in case, but I'm hoping to learn the plowing schedule better so I can hit the sweet spot between fresh snow and newly plowed roads! A beautiful snow up near Mt. Hood this morning after the snowline dropped early yesterday. A Christmas present for all the area skiers, who where flocking up to the ski resorts as we were heading home from our early morning snowy walk with Clover. 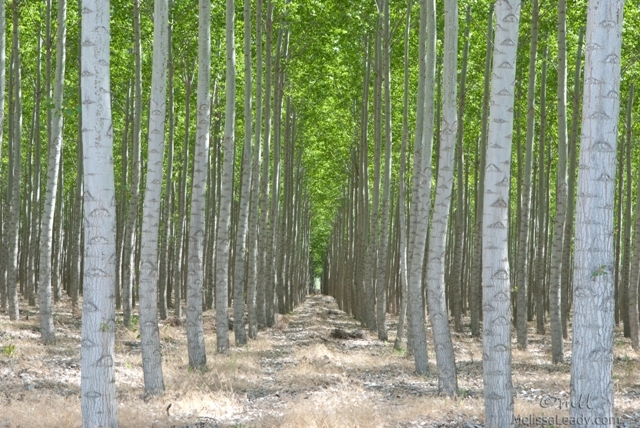 A summertime view of the poplar farm in Boardman, Oregon. Another photo buried on my SD card, this time from a trip to Montana last July. 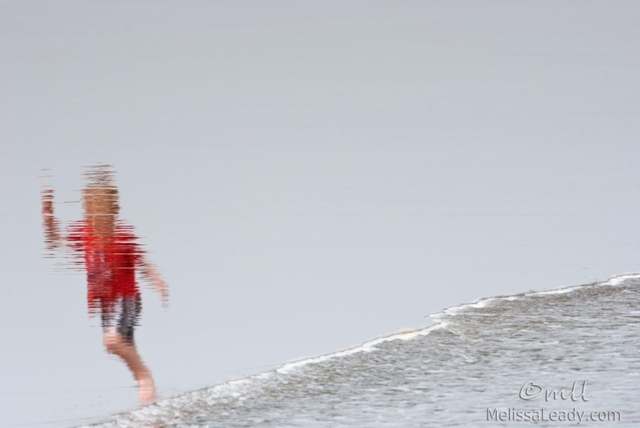 At the time I was more interested in an abstract panning photo, but I'm glad I took this more traditional view. Today the tall trunks remind me of columns in an outdoor cathedral, where man and nature intersect magically at this sustainable tree farm. The time has come to clear out my SD card, and it seems a sort of fitting end of the year event. It's a fairly large card that can hold almost 1400 large jpeg and RAW files, in this case dating back to our trip to the Lincoln City Kite Festival at the end of June. It's interesting how my opinion of my photos can change over time, and I'm happy to have such a large space between initial viewing and second look. 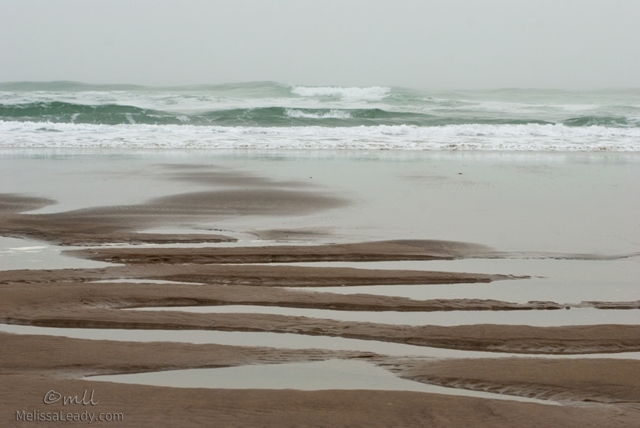 This overlooked image taken on an overcast stroll down the beach in Lincoln City is one that stood out to me today. Maybe I'll have a few more second chance photos to post in the coming days. Not the most inviting of fence signs! 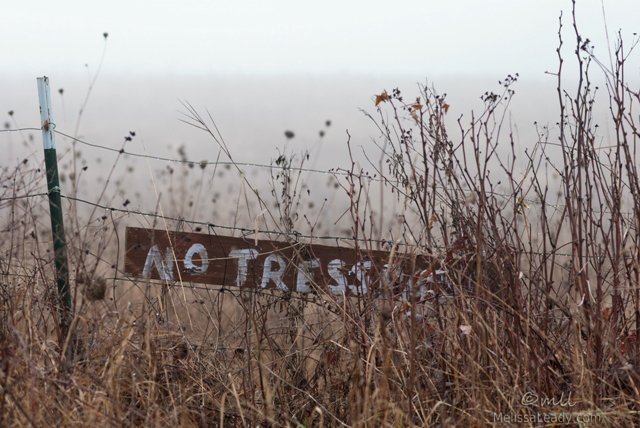 I was wondering why the owners bothered posting it because it doesn't seem like a location that would have a lot of trespassing trouble. I wouldn't have even considered climbing over this fence, even on a sunny day! 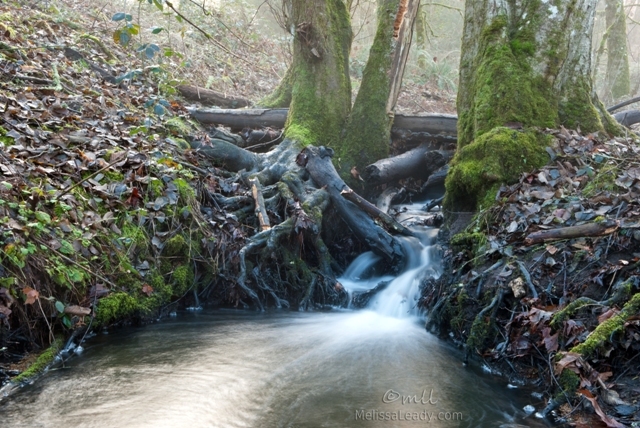 I pass by this little nameless creek almost everyday on my dog walk with Clover, but never think to photograph it. 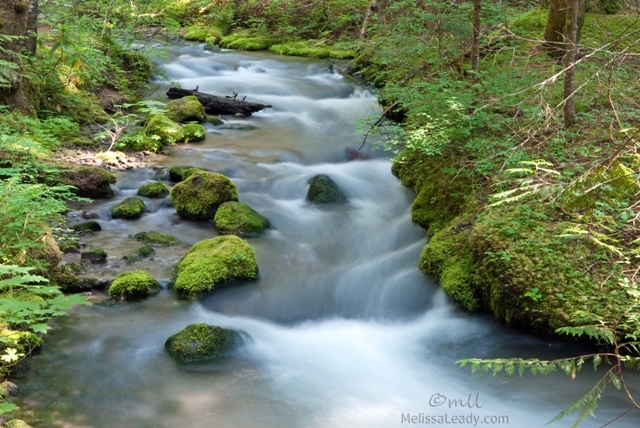 After last week's heavy rain, the little creek started making some noise and I took notice. Water was flowing between the trees and also around the tree on the left, and it was such a pretty sight. The thing is, I never walk with my camera these days, let alone with my tripod, so it took me almost a week to remember to bring them on the walk. This morning the little creek was whispering faintly, but the scene was just as pretty because we had a light fog with the sun shining brightly through. I will have to try again here after another heavy rain. I awoke to a beautiful foggy morning. Our winter inversion pattern has returned. 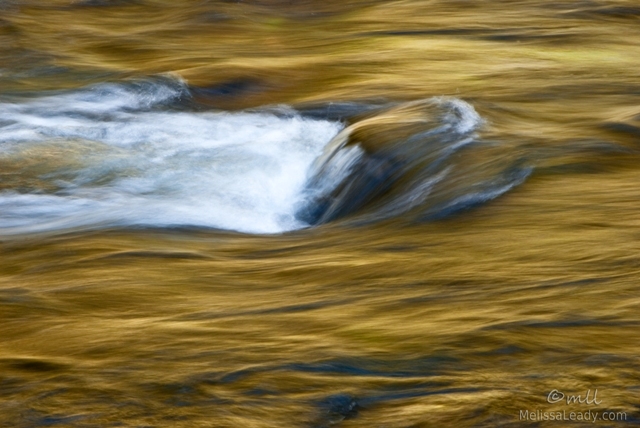 The Lewis River flows from Mt. Adams down to the Columbia River, and technically I think Lake Merwin is just the name for a dammed up portion of the river. 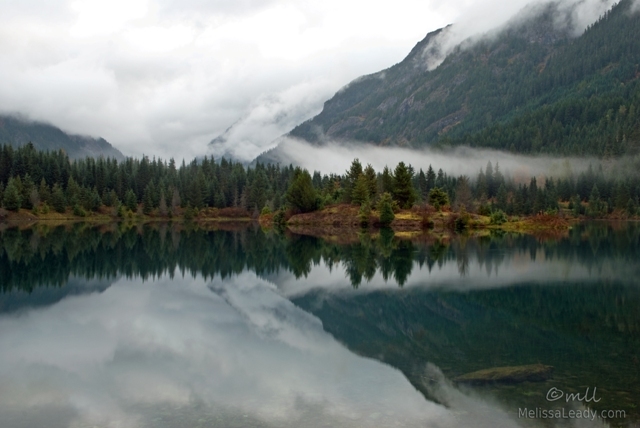 Three adjacent dams form Lakes Merwin, Yale, and Swift, and the road to Gifford Pinchot National Forest passes all three. 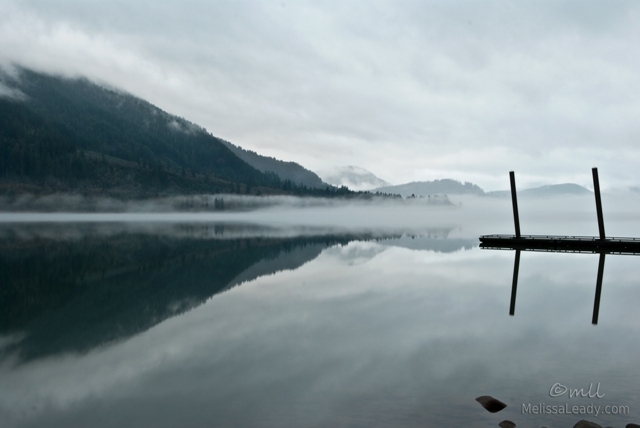 This particular section of Lake Merwin offered the most ethereal reflection in the late afternoon mist. 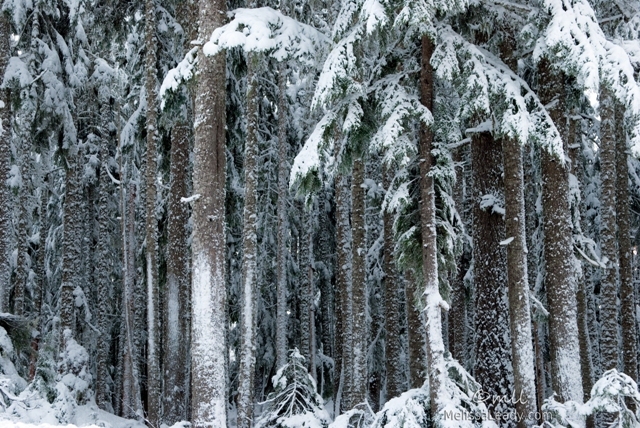 We headed up to Gifford Pinchot National Forest over the weekend to find the perfect Christmas tree as part of the National Forest Service holiday tree forest-thinning program. 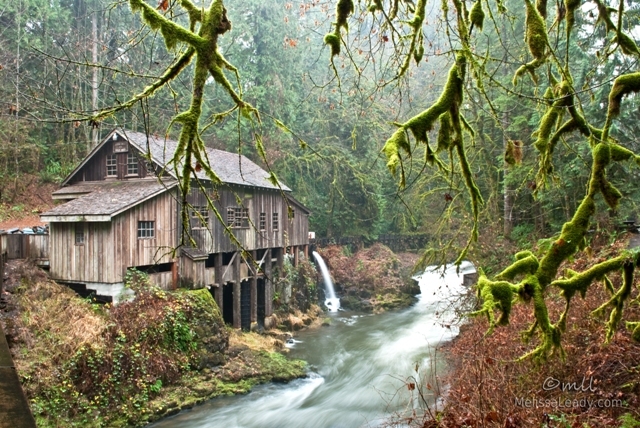 Our drive up toward Mount St. Helens winds along the Lewis River, and this working grist mill is just off the main road. On weekends you can come up here and get freshly ground wheat or cornmeal. It's an idyllic historical spot; this photo was taken from the sidewalk portion of an old covered bridge as the roof shielded my camera from a misting rain. I've photgraphed this mill several times in the last few years, but I've never been satisfied with the colors until today. I really like how the moss on the nearby tree turned out. In our rainy season the moss turns a rich shade of green, and I'm happy with how it photographed against the diffused foggy background. 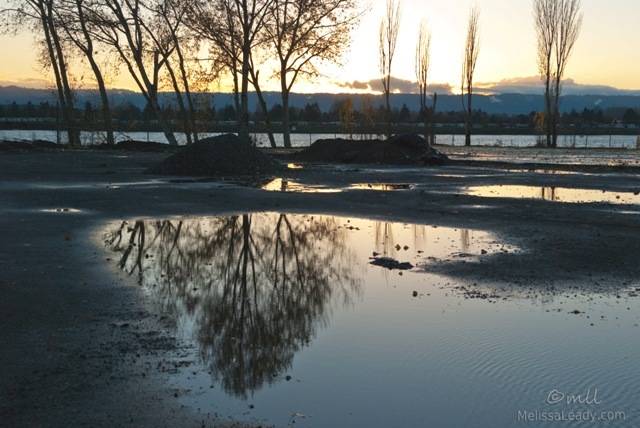 Columbia River in Vancouver, but it will likely be a welcome improvement. 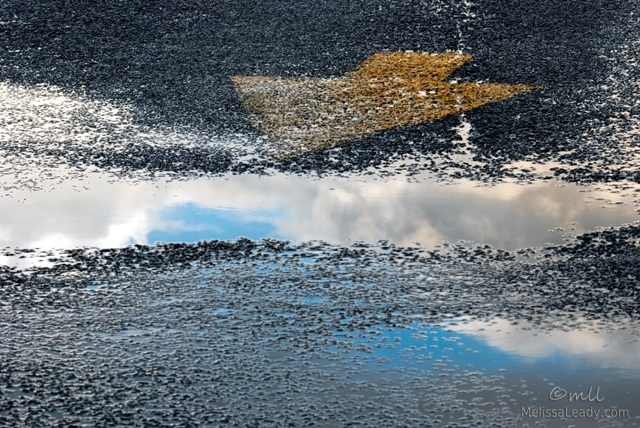 with these great puddles reflecting the winter sky and trees. 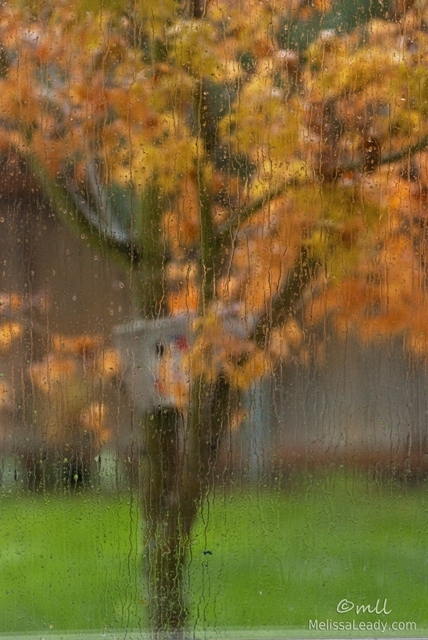 Ah, November. This might be a good post to make my annual declaration of November as my very favorite month. I've been thinking about why I love November so much. It definitely has a different feel here in Washington than it does in the Midwest; we're well into our rainy season now, although we did have a good spell of morning frost last week. 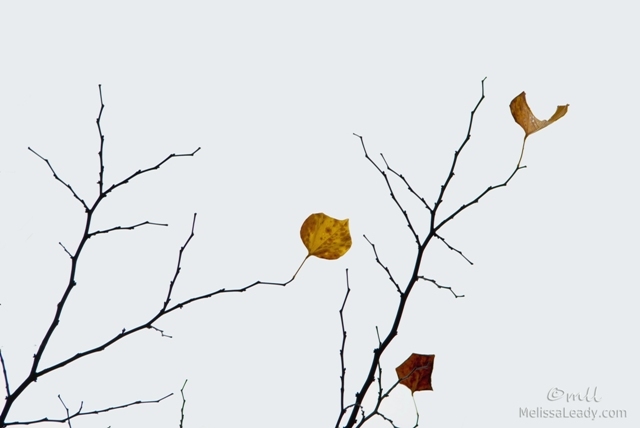 Still, there's something about this particular change of season from fall to winter that I find so beautiful. I'm still working away in the kitchen. 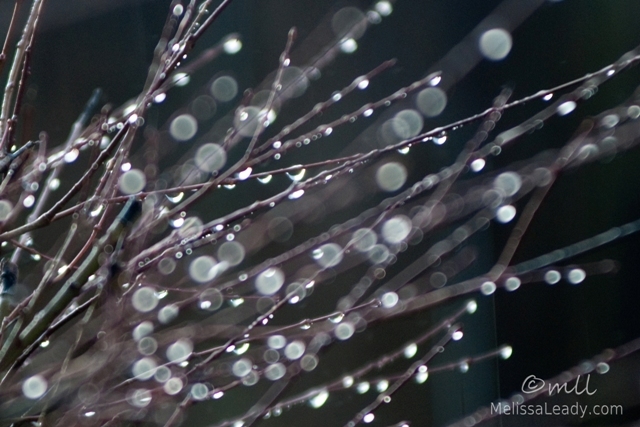 And I'm still photographing the little tree near my kitchen window, but this time from the sliding glass door. As I'm posting, it's gorgeously sunny; the rain spell I photographed was our second of the day, but probably not our last. A good rainbow day. Today has turned into a big prep day for Thanksgiving, mainly because I've got to get some fermented veggies and chutneys going so they will be done in time. It's got me reminiscing about past Thanksgivings, family, my own childhood and my grandparents. Playing charades, wearing radishes on my fingers, making a fort under the table as the adults had their conversations, the dessert table at Strongbow's, the turkey platter shaped like a turkey. And it's got my thinking of Thanksgivings to come. It's a rainy day, and sort of unusual to have the rain hit the back window like this, but I thought it was especially pretty. Somehow the warm kitchen, the festive cooking, the beautiful scene out my kitchen window, and fond thoughts of family have all come together in my mood today. Along my dog-walking route, at the edge of subdivision and country, sits a house on a multiacre lot. This house has been for sale since we moved here almost a year and a half ago, and one of the problems was it has poor "curb appeal" as they say. 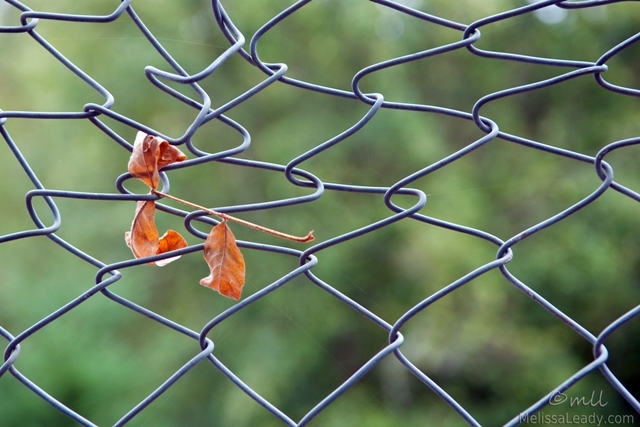 The fence was makeshift and the top edge hadn't been trimmed evenly. It wasn't that surprising to me that no one was making an offer. 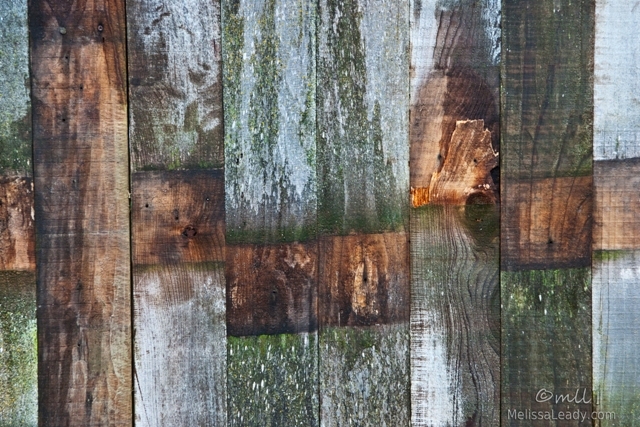 Last week the owners finally got serious about selling; they completely tore down the old fence and reassembled it with a nice clean edge, reusing the old planks. 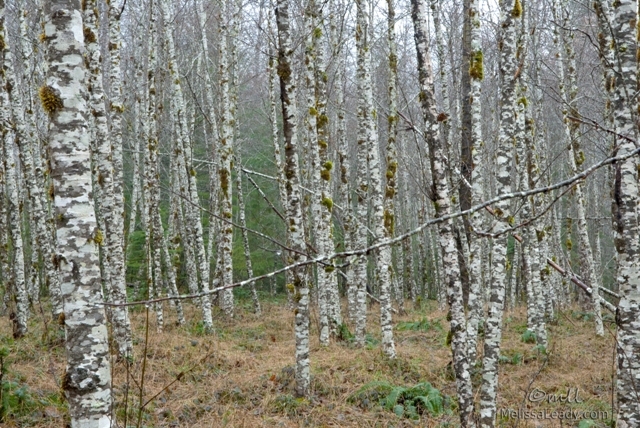 The result is a really pretty patchwork of fresh and weather wood. High tide in Olympia, Washington last weekend. We're having a late fall for color change this year; even with all our rain this week, there is still a lot of color on the trees. On a rainy day in Washington. I love stopping in Olympia on a trip up to Seattle. 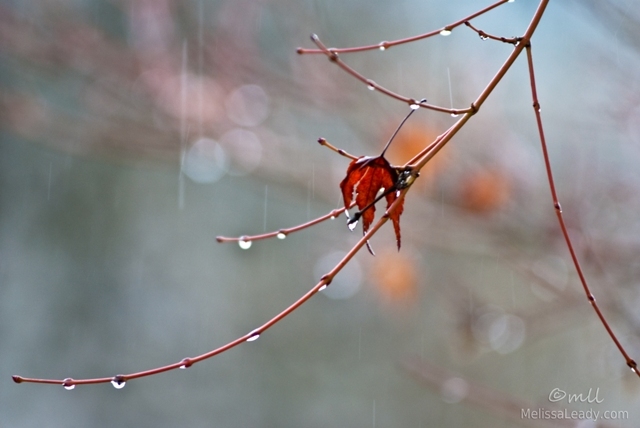 The rain was just clearing as we pulled in over the weekend, so I made for the water with my camera. It seems like I usually photograph Percival Landing on the western side of Budd Inlet. 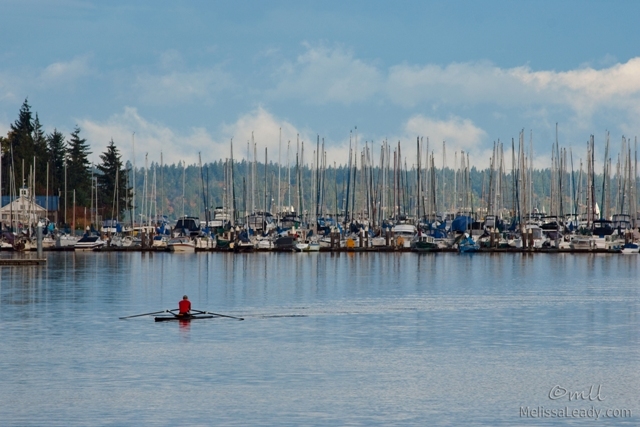 On Saturday we stopped along the eastern side, looking north toward Swantown Marina and a lone rower making his way in. We were up in Seattle for a birthday celebration last weekend, which means we got to visit our son at college. He got up with me and Bill well before dawn, and the three of us headed up to Snoqualmie Pass for a sunrise hike around Gold Lake Pond. 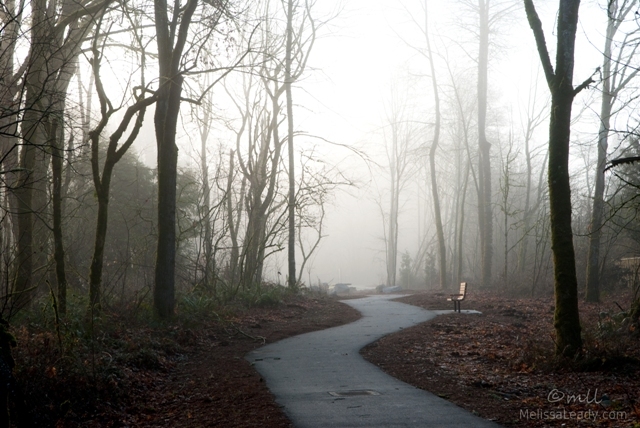 It was a peaceful time of day for a hike, and we had a lot of fun photographing the mountain and mist reflections. There wasn't a bad angle to photograph, but the prettiest photos happened early in the hike when the mist was the heaviest. 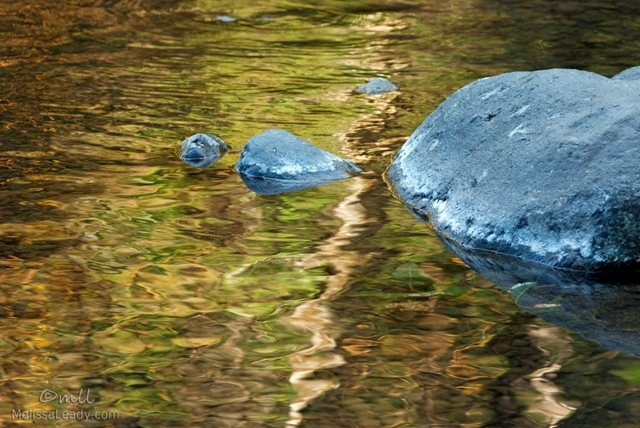 I especially liked this photo, because of the rock visible in the crystal clear water. Rockaway Beach at low tide during the thickest fog of the morning. In a low contrast sort of way. 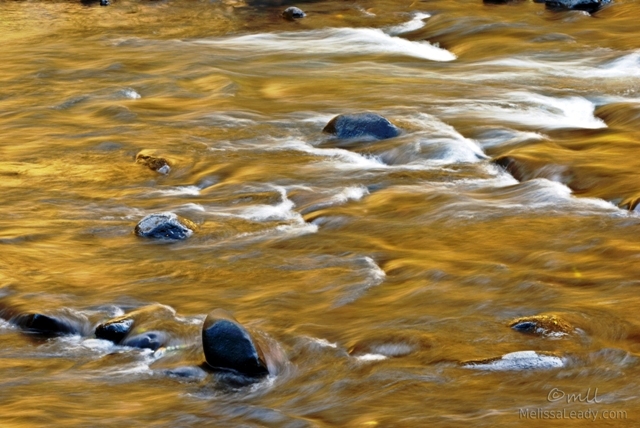 Another version of the liquid gold photo from our fall hike along Netarts River last week. I felt like there was more green than yellow in the trees, so the reflection color was really surprising to me. I compared these images to some from a photo shoot up near Lake Tahoe a few years ago and was surprised by the color difference. Near Lake Tahoe reflecting trees were Aspens, and the reflection color was more of a lemon yellow. I regret not paying more attention to the tree variety along Netarts River, but definitely some evergreen mixed in with big leaf maple which turns a yellow to rusty color, so I guess a gold color must have more green in it. We're probably still a few weeks away from peak leaf color. The road to Tillamook follows the Netarts River down the coastal range. I didn't have to get very far up that road, maybe 15 minutes driving, before I had left the thick fog behind and found myself in a beautiful sunny early fall scene. I could see that the river was reflecting the yellowing big leaf maples so Clover and I made an unplanned stop for a river hike. (Lucky dog! She even went for a little swim!) After all that thick morning fog, I have to say I felt a little like Dorothy when she arrived in Oz! 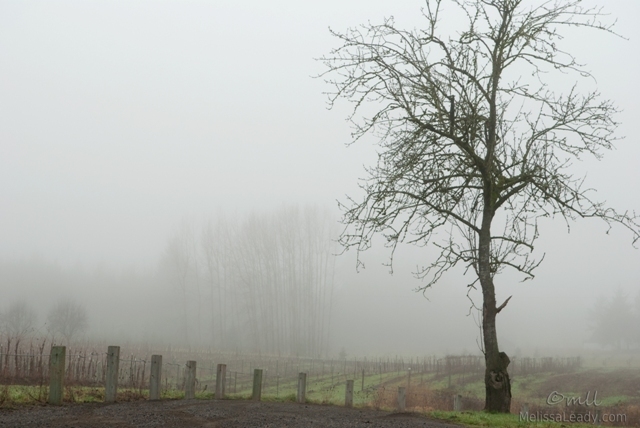 A slightly foggier scene from my trip to Tillamook, Oregon yesterday. This jetty just north of Tillamook is connected to a beautiful rock outcropping with some spindly pines growing on it; they reminded me of Monterey. At the time I didn't see a way down to the beach, and I had trouble photographing them from my angle, but liked the way the jetty was photographing. 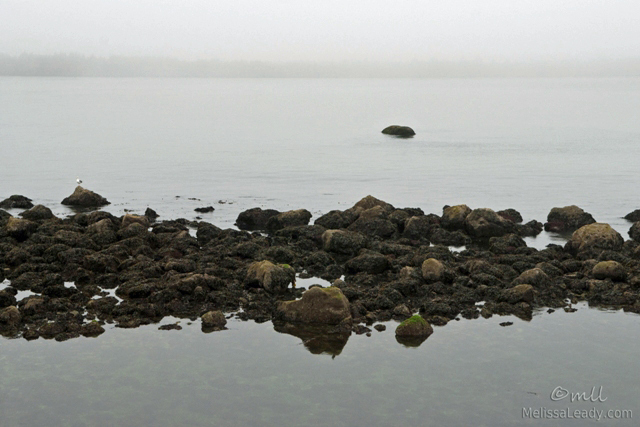 It's a good low tide shot, especially with that "beauty mark" rock in the distance. Later, as I was driving home, I noticed that there was a small beach accessible with a little climb, so I'll have to try that out next time...at low tide, of course! I've missed a few opportunities in the past month for a low tide sunrise photo, but thought conditions would be right for a beach visit this morning. I started out under a clear sky, following the setting blood moon until I approached the coast; then the moon disappeared behind a thick marine layer. Sigh. Still it's always beautiful at the beach, and Clover and I had a great time strolling around here. I've got several photos to share from this trip; a few from the coast and a few from a sunny river hike just a little ways inland. One of the things I liked about Rockaway Beach was the ribbon-like tide pools that formed at low tide, so that's why I came back here this morning. 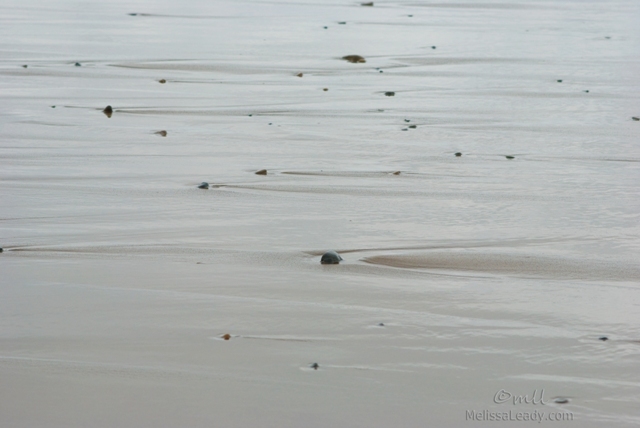 In this photo, the tide had just shifted, and was starting to make its way back up the beach toward the tide pools. Well, I actually wanted to pick up the camera yesterday, which I consider a very good thing. I'm not really sure why this particular parking lot scene inspired me, but I'm not going to question it too much either. I've had a couple of day trips in mind to do all month, and hopefully now that I'm feeling a bit more inspired and energetic I'll be up for taking a drive with my camera later this week. Also, just on a side note, after a long dry summer our rainy season is finally arriving! I'm sure I"ll be sick of it by March, but right now I'm loving it!!! in Long Beach a few weeks ago. School started here yesterday, and the construction fence that has blocked the path between my subdivision and the schools is still in place, although a little worse for the wear after all the people who have squeezed through it this summer. I hope the work finishes soon; even though I don't have any kids in school this year, I use that path all the time walking Clover! Back to the mouth of the Columbia for today's photo, which was taken on the bridge between Washington and Oregon, thanks to a construction flag stop. 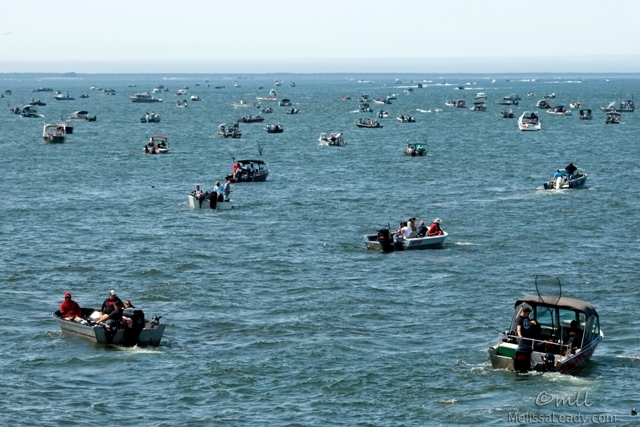 I remember reading that salmon season was beginning here, and I also remember reading that it would be a good season, but I have to say I wasn't prepared for the quantity of fishing boats near the bridge! Must really be a terrific season! Bill has a fishing trip planned for November...I sure hope there are still some salmon left by then! 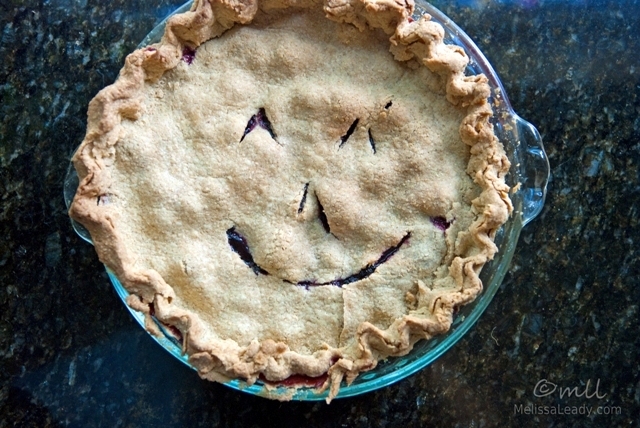 ...and made a yummy blackberry pie! 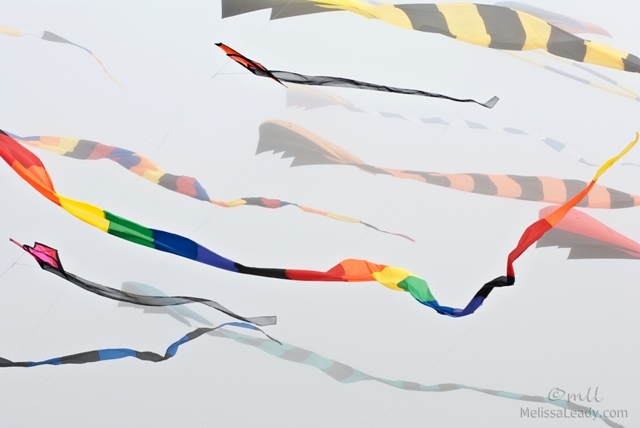 Another one of my more abstract takes on the Long Beach Kite Festival last weekend. I love how the tide water sits on the sand and creates such a strong reflection at beaches in Washington (and Oregon), and I was hoping to recreate a kite-flying scene by including the reflection of a person. Not many people were walking by, unfortunately, but I got several of this guy. Actually, having a fixed idea of a particular shot I want is always a bad thing for me. The actual conditions are always different than what I imagined, and I always spend too long looking for the shot anyway. 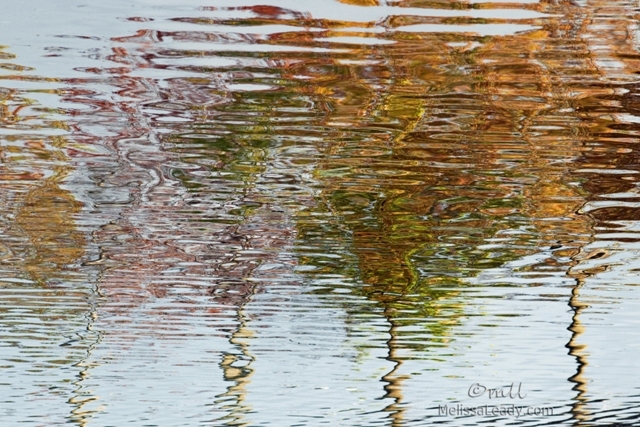 In this case, I gave up early and moved on; working at a 180 degree angle to the shoreline produced a blurrier reflection than I was hoping for. This little boy was so cute playing along the shoreline in Long Beach last weekend. 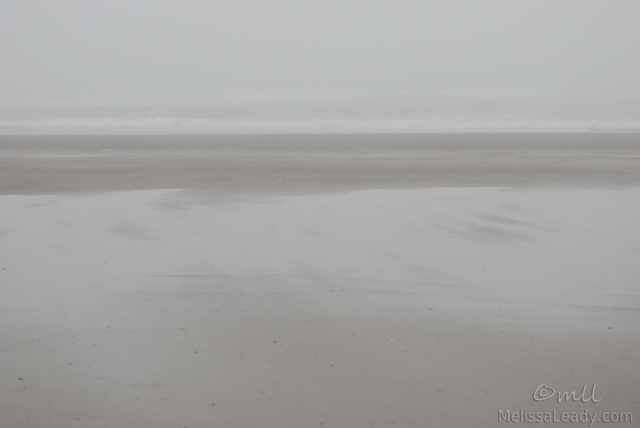 He was scared of the tide line, but kept approaching and then racing away as each little wave moved up the shore. I really wish I didn't compose this shot with him leaving the frame like that, but I just don't have a photojournalist sensibility; so I had framed him in exactly the right spot to not move, but I wasn't prepared for him to run back up the beach. Why? Lack of experience photographing people, I suppose. 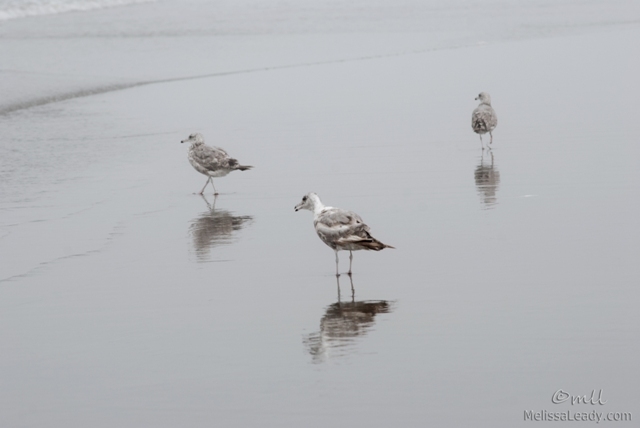 Anyway, such a terrific reflection in the Washington sand as the tide recedes! From the Washington side, and just before we crossed the bridge into Oregon. Bill was driving when I took this shot. I wish I'd asked him to stop because it's a little blurry, but at the time I was just playing around. I liked the old pier silhouette, and the fishing boats in the distance. I'm not sure what bridge is behind the boats, but it doesn't look like the Astoria Bridge to me at all. 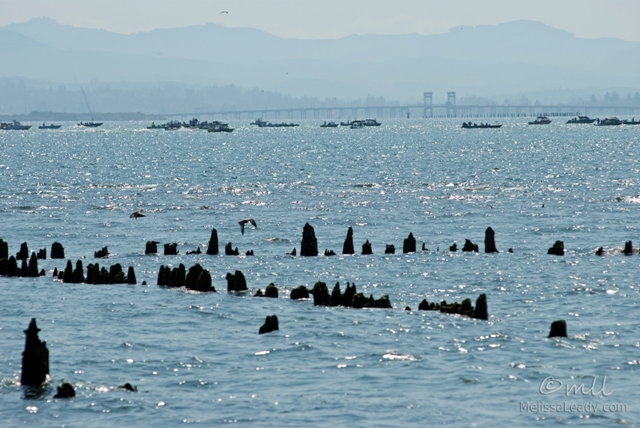 That is Astoria, Oregon on the far shore, so it must be a smaller bridge there, which I'll have to take note of next time I visit. 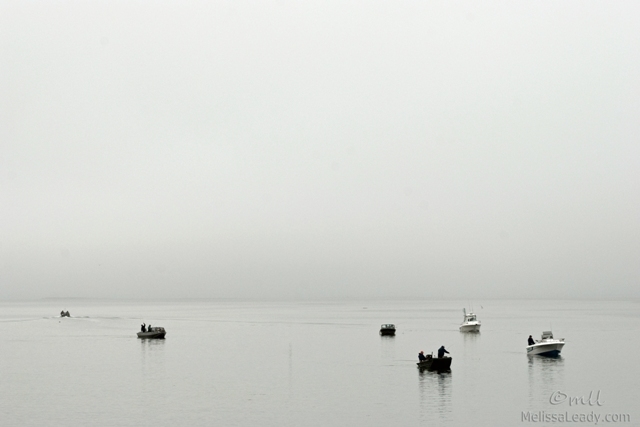 For all my complaining about the foggy conditions at the Long Beach Kite Festival on Saturday, thick fog does make for some interesting photographic opportunities. Especially when there are bright colors involved. 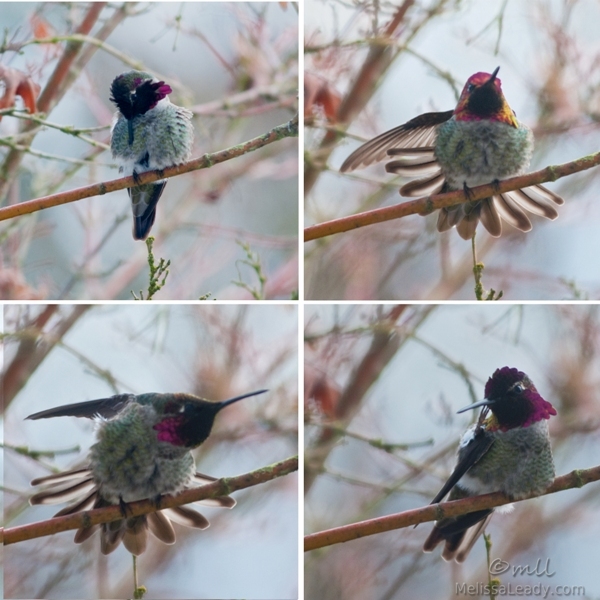 I'm always amazed by how vibrant color appears when they are closer to the camera and out of the fog. And I just loved watching the wave patterns made by these kite tails! 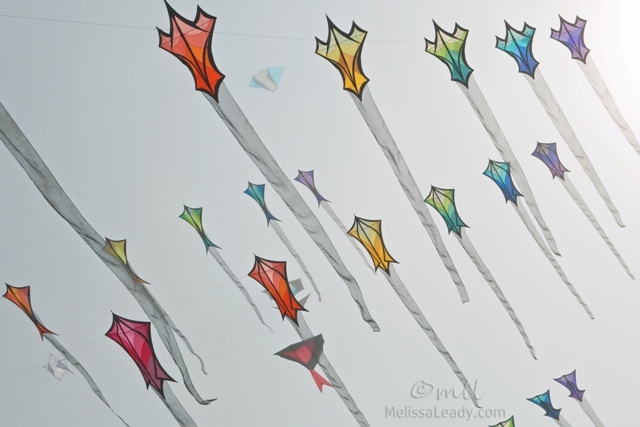 Plus I love going to the beach no matter what the weather, so I kite festival is a fun opportunity to explore the shoreline. 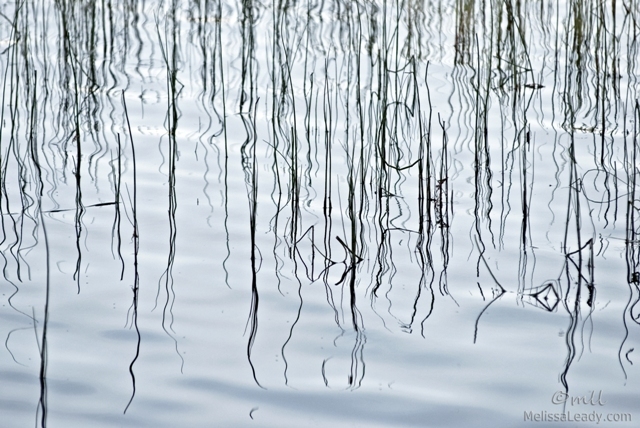 I couldn't help but photograph the reed reflections during our hike around Trillium Lake. All the kayakers and paddle boarders made an interesting wake for the reflection! Here's a slightly broader view of Zigzag River leading up to the falls. It was such a small and gentle river (our dog Clover hopped around in the river along the hike; it's much too shallow for swimming), and yet it moves with enough force to have patches of whitewater throughout. In yesterday's post I had a question about photographing moving water that I figured would be good to answer in today's post. 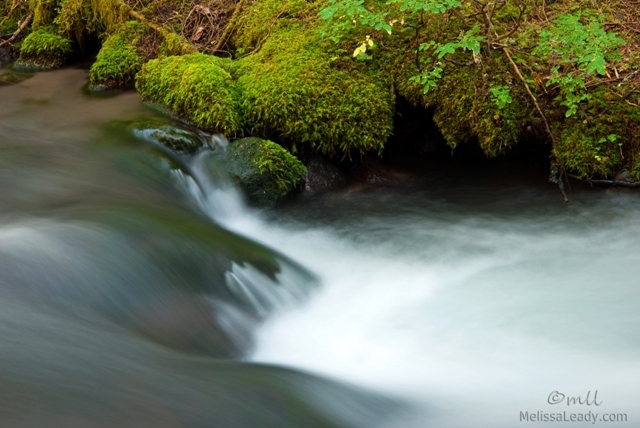 To capture the blurry motion of the water, you needs two things: 1. 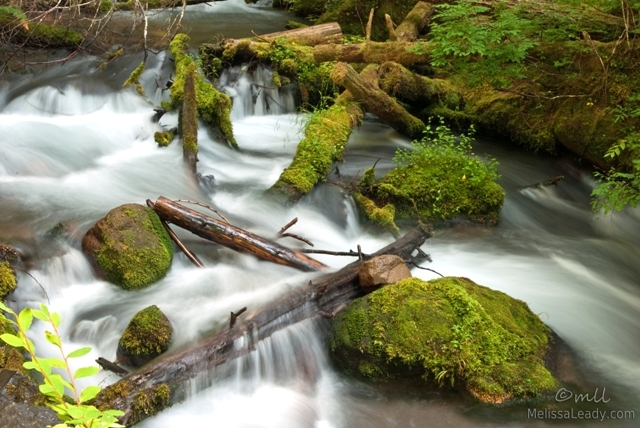 A tripod or method of keeping your camera perfectly still, such as propping it on a log, and 2. 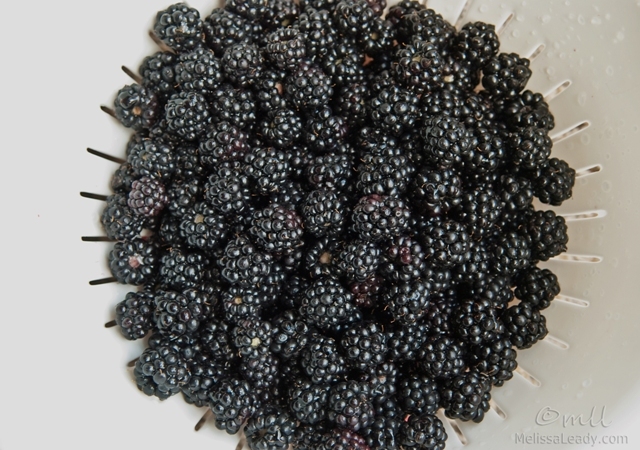 The ability to adjust your shutter speed. 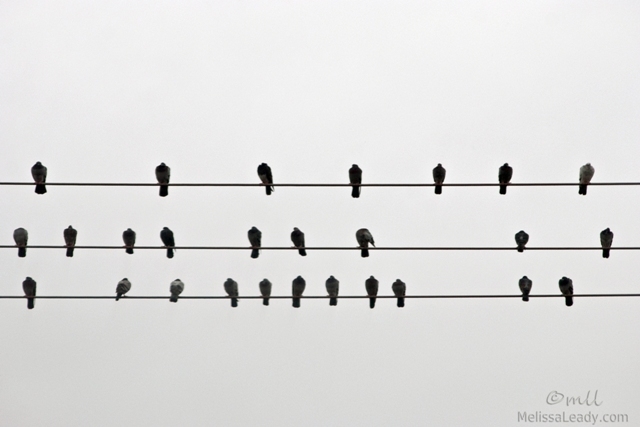 If your camera has the letter "S" on the dial, you can set shutter priority. 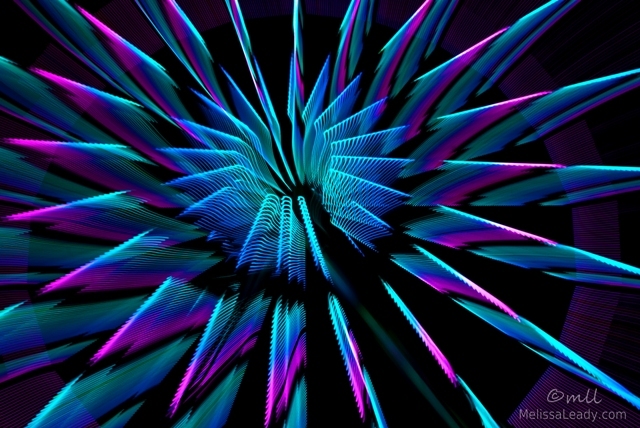 With the dial set to "S", adjust the shutter speed to somewhere between 1-3 seconds. It might look like 1" or 2.5" etc. you can play around with this setting and see what you like, but I think somewhere in this range gives a nice sense of motion. We had a nice getaway weekend, camping near Mt. Hood. This is the mountain most easily visible from where we live, but I didn't realize how close it actually is to us. Definitely an easy day trip, although the camping was fun, and the weather was perfect. I also didn't realize how much there is to do up here! We initially planned to hike Mirror Lake, but the ranger advised against it, saying that on summer weekend we'd be hiking with half of Portland. 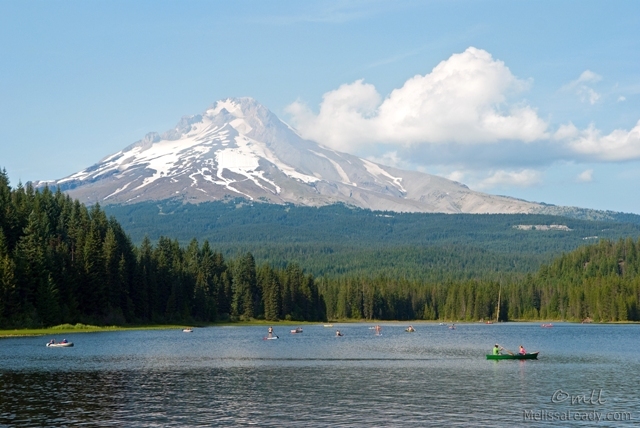 I have to say though, that the other half of Portland might have been here at Trillium Lake. It was an easy two mile hike around the lake, handicap accessible the whole way (although portions do the boardwalk could use a little repair! ), and the lake was full of kayakers, rafters, and paddle-boarders. I was so surprised to see this truck full of bottled water during our visit to Logan Pass in Glacier National Park last month. 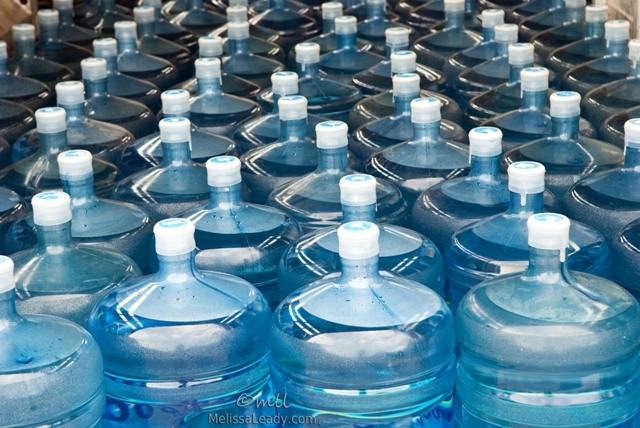 The irony of providing bottled water in the midst of some of the purest water on the planet was not lost on me. I asked the rangers about this, and it turns out that we happened to visit during a two week interval when the park's water tank was receiving maintenance. So...we missed out on the mountain fresh water while we were there. 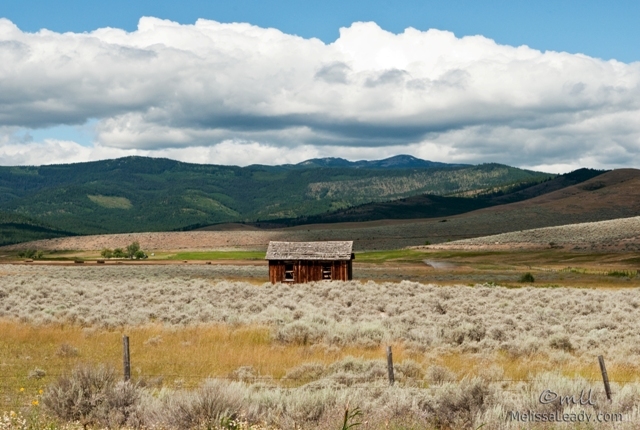 A tiny little house with a very big view in Flathead Valley, Montana. If you start to feel cooped up inside, looks like lots of room to roam outdoors. Linking to Thursday's Good Fences at Run*A*Round Ranch. 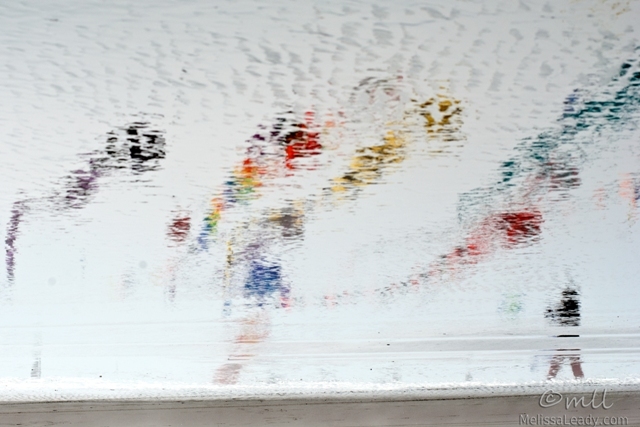 I thought this photo from the Clark County Fair came out sort of interesting. 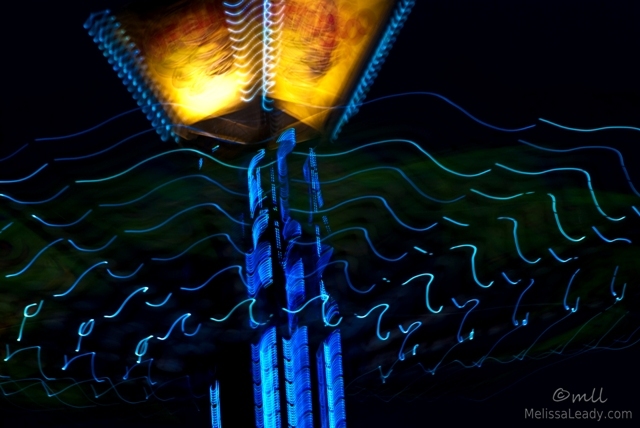 The ride is a combination of swing chairs and tower. Riders sit in a chair swing which rotates in a circle while ascending and descending the tower structure. I don't know the name of it, but it's clearly written on the sides of the tower in yellow and red letters, which blurred to a lantern-like quality because this long shutter release shot was hand held. The wobbly handheld quality is what makes this photo interesting to me. 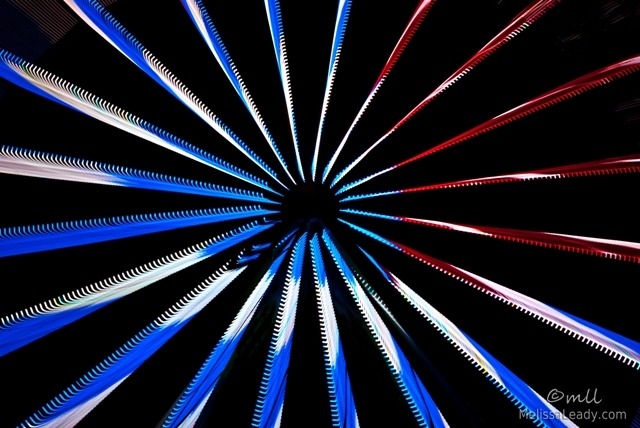 This Ferris Wheel at the Clark County Fair had such a big light show pattern, and I photographed it for so long, that I really think I could post a different Ferris Wheel abstract every day for the next month! I won't, I promise. This is my last Ferris Wheel shot (from this fair, at least! ), because I really liked the red, white, and blue flag theme. I do need to update my website though, so I'm considering doing a Ferris Wheel gallery, because I have so many of these shots now.